Note: this is a sponsored review. The figure was provided by NECA. 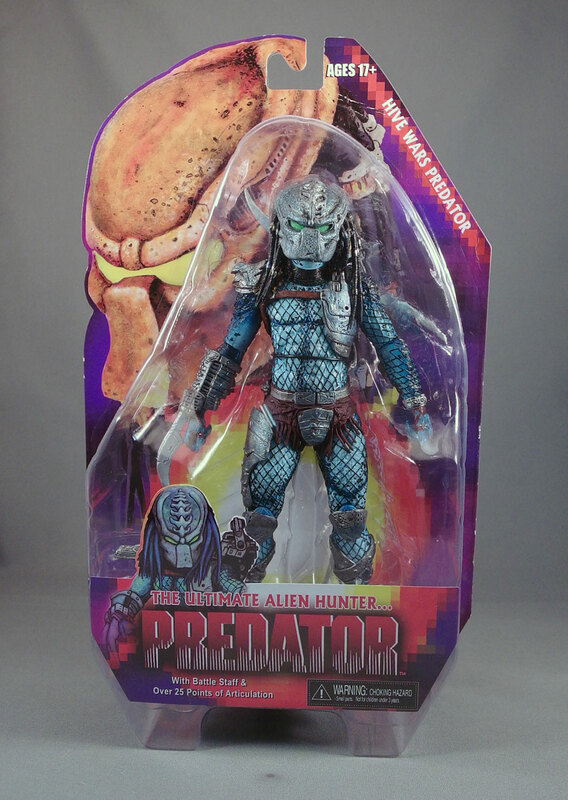 In the late 1980s, there were few action figures I wanted more than a Predator. Sadly, by the time Kenner started making Predator figures in the 1990s, I had entered the four-to-five-year period where I was more interested in Magic: The Gathering cards than action figures. I did, however, pick up the Alien vs. Predator two-pack, because I couldn’t resist movie-accurate versions of the Predator and Alien. but all the other crazy, weird variants Kenner made were completely uninteresting to me. Today, I still want to have a regular “classic” Predator before anything else, but I already have that. At this point in my life, I’m able to appreciate the creativity that went into Kenner’s line. The figures had unique accessories, bright colors, and the exaggerated muscle sculpting that marked many 1990s toy lines (including, hilariously, the first few waves of Kenner’s comeback Star Wars figures). I think that sort of grotesquely-muscled, semi-posed design was due to a stylistic hangover from the immense popularity of Playmates’ Teenage Mutant Ninja Turtles (whose own style had been influenced by Masters of the Universe). 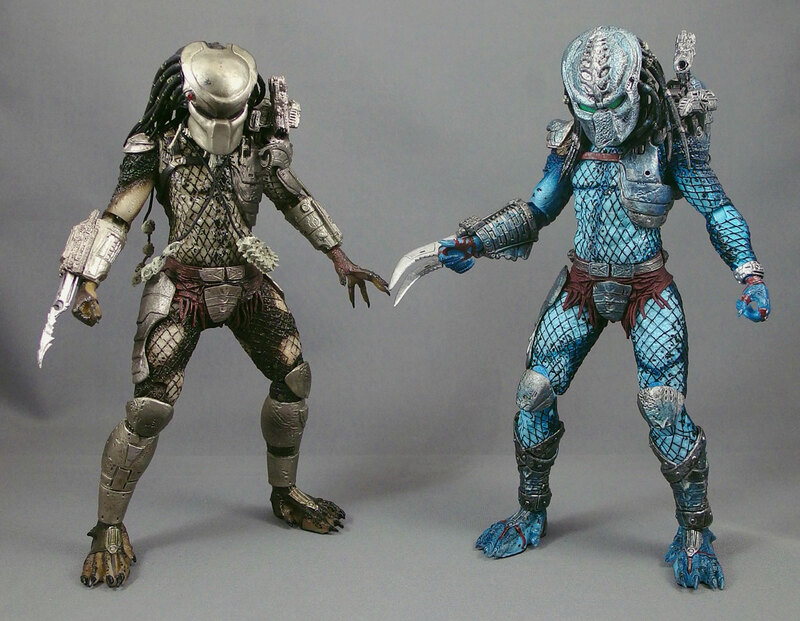 Those original Kenner Predator figures were designed to appeal more to kids than cynical teenage collectors. In the 1990s I was both too old and too young to appreciate Kenner’s work. But now, like many older collectors, I can look back on those colorful figures and appreciate their appeal. 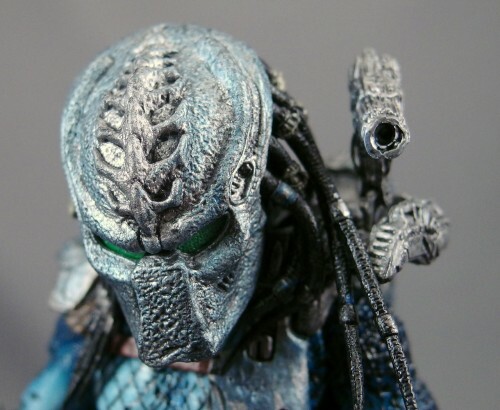 NECA has realized the same thing, and after years of producing film-based Predators they’ve decided to mine Kenner’s archives for their tenth series of Predator figures. There are three figures in the series – Lava Planet Predator, Nightstorm Predator, and the subject of this review, Hive Wars Predator. 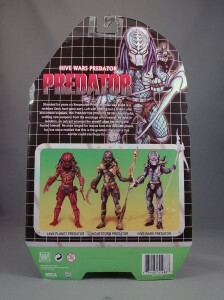 Hive Wars Predator is based on a Kenner series that came out in 1998 near the tail end of Kenner’s run on the license. Technically it was an Aliens line, not a Predators or AvP line, but by then the Aliens and Predators lines were fairly interchangeable. The series was exclusive to Kay-Bee toy stores and fairly hard to find nowadays. 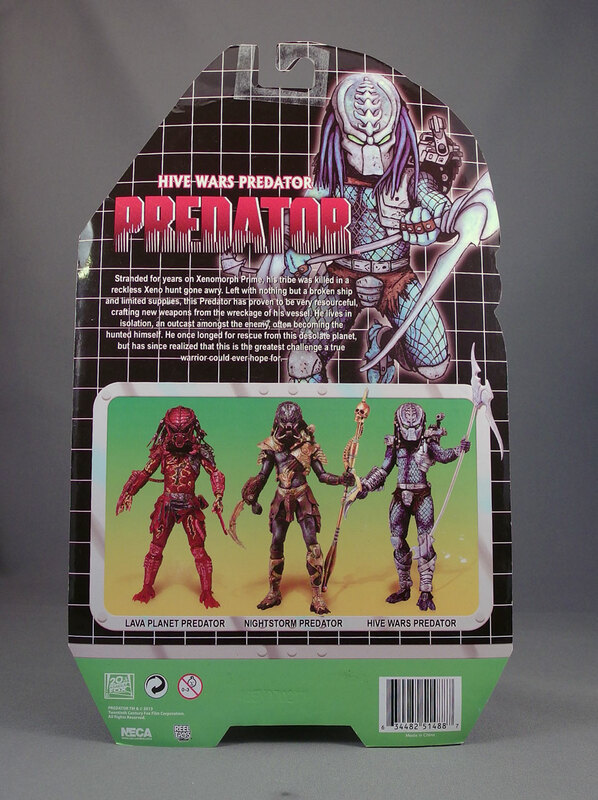 NECA’s packaging for Hivey is meant to evoke the Kenner Predator packaging – not the Aliens: Hive Wars packaging, as it happens, but the one for Kenner’s Predator-specific line (seen here). NECA’s card features some great comic-style art of the character, drawn by the sculptor of the figure’s new parts, Trevor Zammit (who, based on his name, must be a 1930s sci-fi superhero in his spare time). 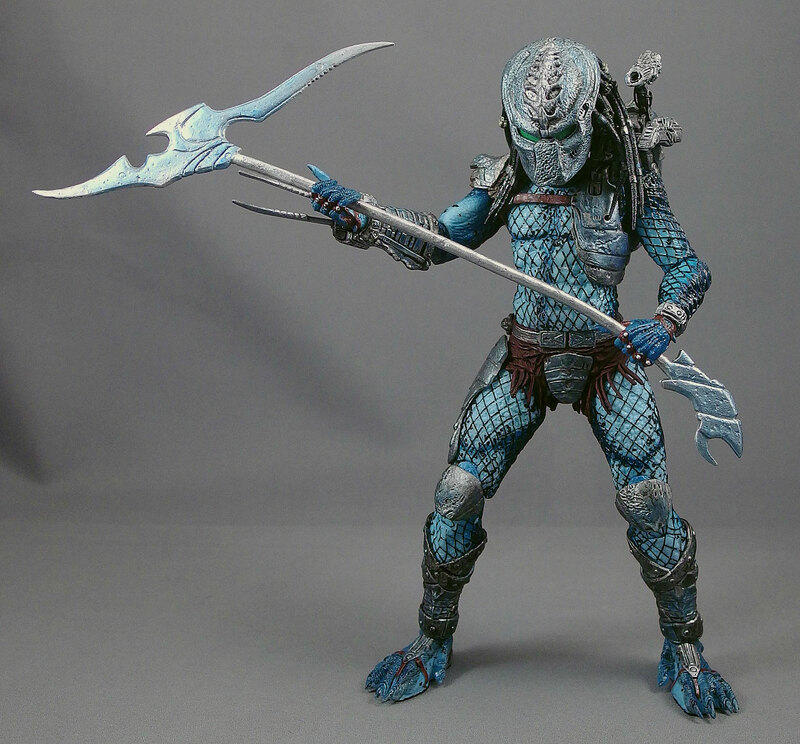 The figure vaguely reminds me of Chris Warner’s art from Predator: Cold War. Stranded for years on Xenomorph Prime, his tribe was killed in a reckless Xeno hunt gone awry. 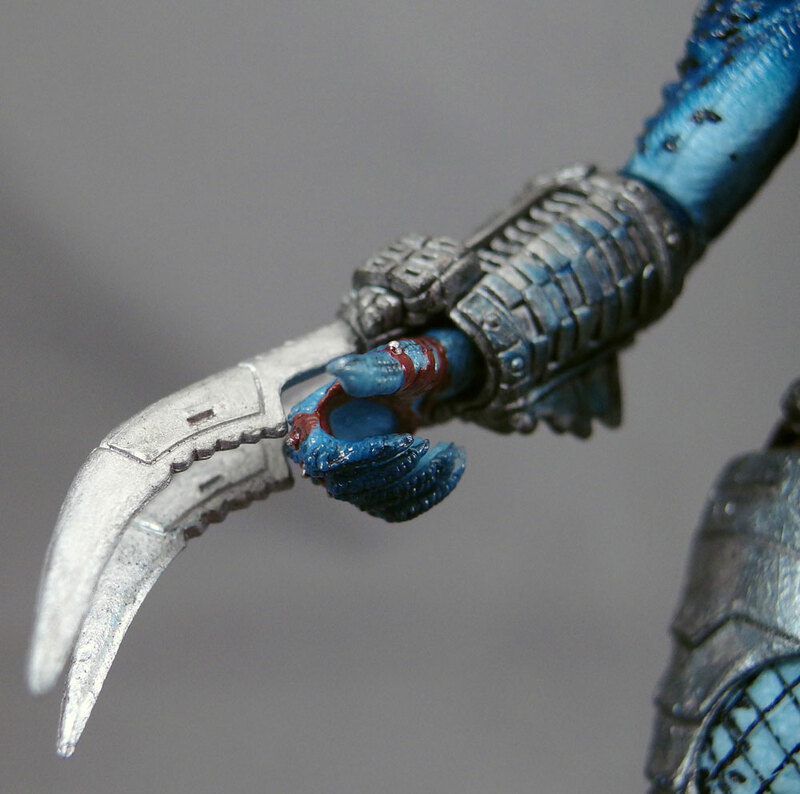 Left with nothing but a broken ship and limited supplies, this Predator has proven to be very resourceful, crafting new weapons from the wreckage of his vessel. He lives in isolation, an outcast amongst the enemy, often becoming the hunted himself. He once longed for rescue from this desolate planet, but has since realized that this is the greatest challenge a true warrior could ever hope for. So he’s basically the Yautja equivalent of Laurence Fishburne in Predators, without the inexplicable weight gain. 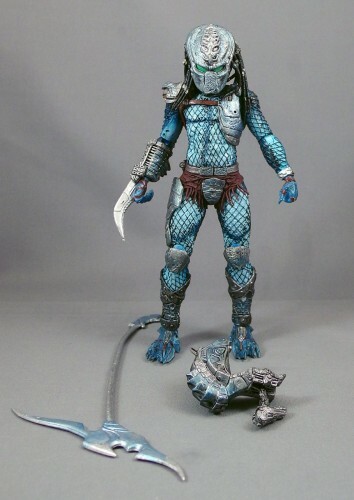 Anyway, I haven’t collected NECA’s Predators line as religiously as some other fans, so I can’t say for certain which parts of the figure are new and which are reused or retools from other figures, but the figure is primarily based on the Jungle Predator. I think the left forearm is new, and I’m definitely sure that the right forearm and lower legs are new, as they’re clearly based on the Kenner figure. 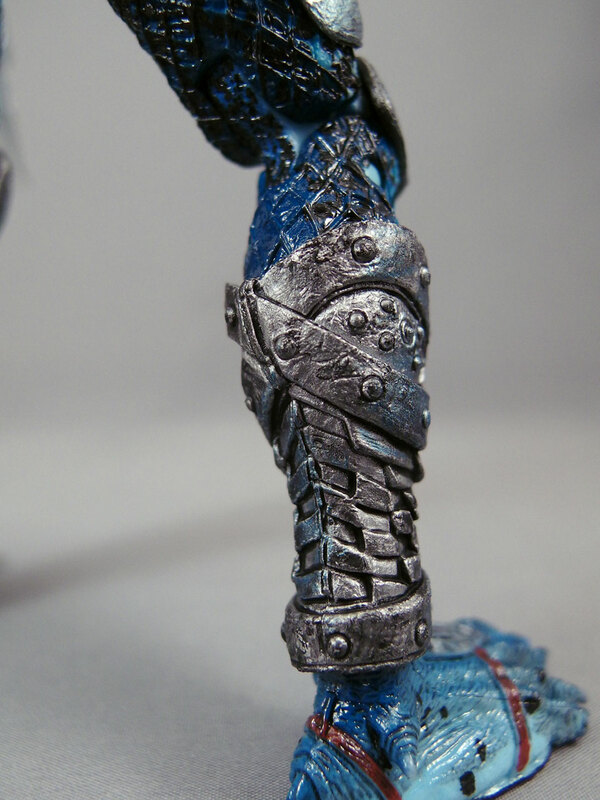 I think the right shoulder armor may be new, and obviously the head is a brand-new sculpt. 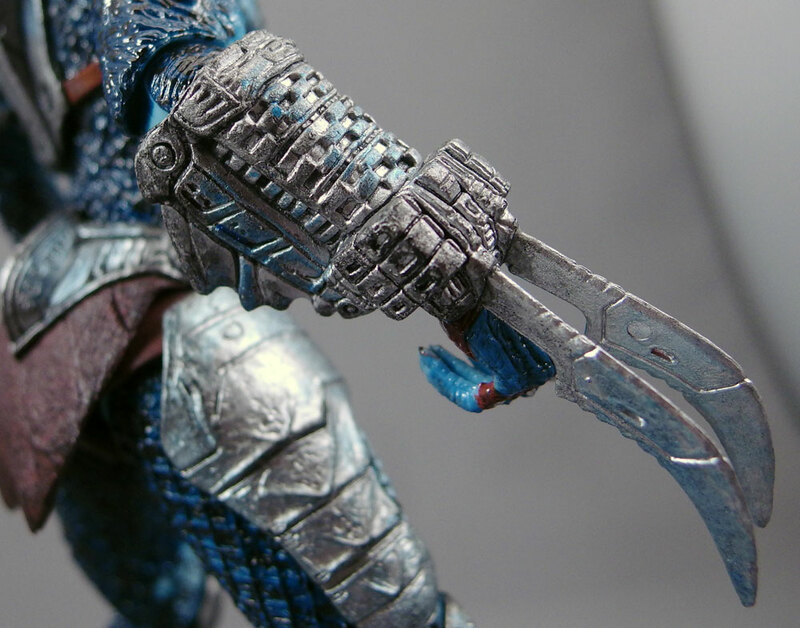 As you’d expect from NECA at this point, the sculpt is superb. 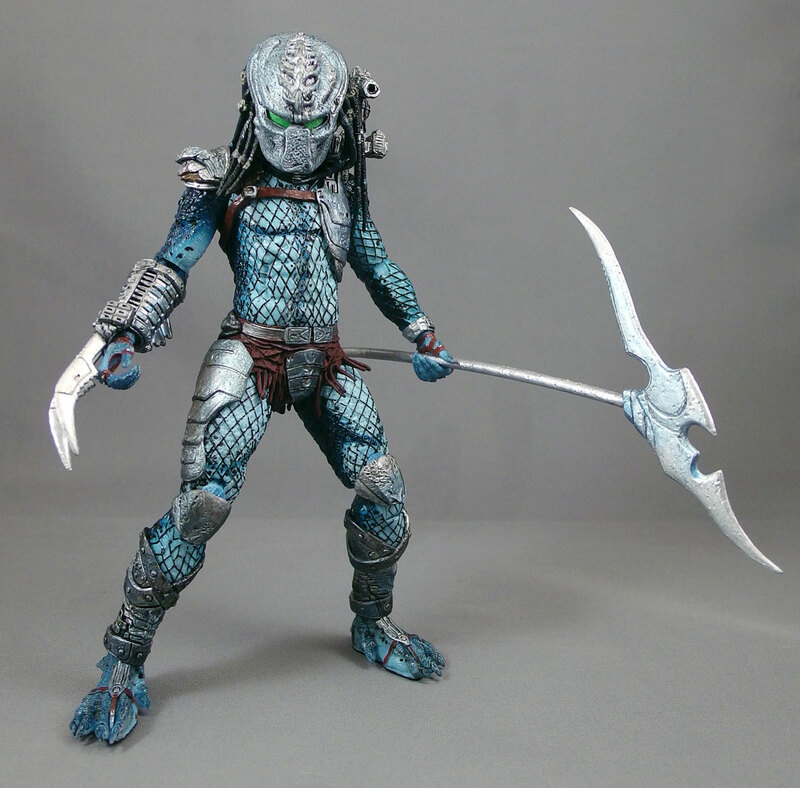 It’s inspired by the Kenner sculpt but stays on the side of the “real-world” aspect, so that Hivey can stand proudly alongside Jungle Predator or City Predator and not look out-of-place. 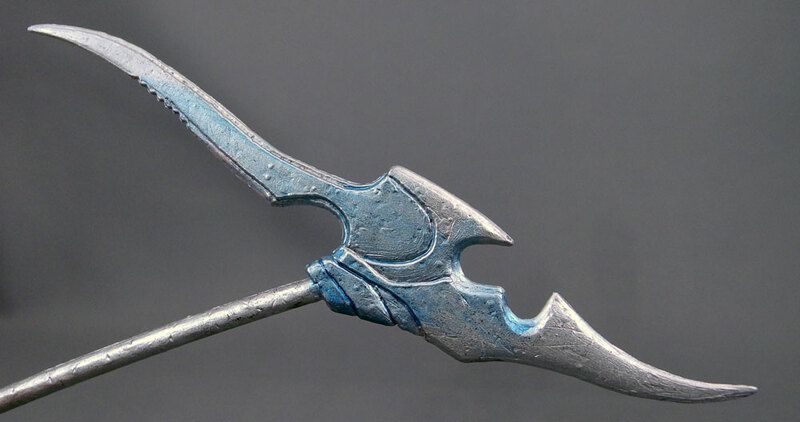 The paint work is also excellent. I’m particularly impressed by the green of the visor within the mask – I’m not sure if it’s a separate piece entirely, or just expertly painted. 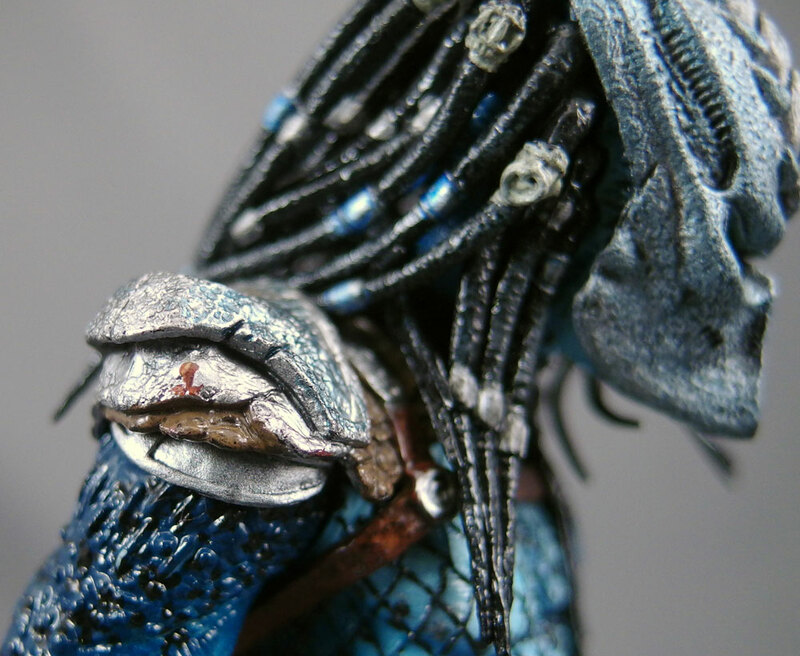 The detail work on the “netting” might be the best I’ve seen on a NECA Predator, and the metal parts have just the right mix of silver, a dark wash, and a touch of blue highlights. Hivey features a ball-jointed neck, ball-and-hinge shoulders, ball-and-hinge elbows, ball-and-socket wrists, a swivel torso, ball-and-hinge hips, swivels where the thighs meet the ball hips, double-hinged knees, and ball-and-socket ankles. Personally I find double-hinged knees a waste of articulation without articulated toes (or rather, the ability for the character to squat on his heels with a hinge joint in the middle of the foot), but your mileage may vary. 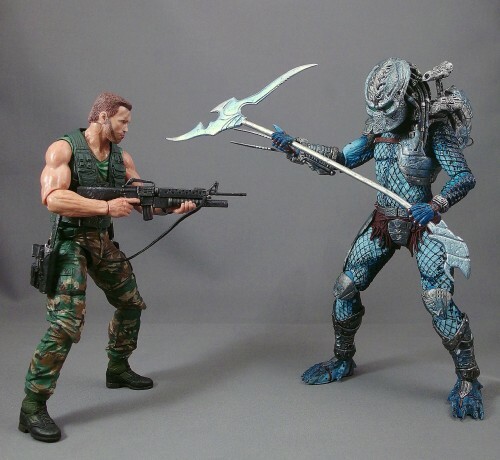 As with all of NECA’s Predator figures, the range of motion on almost every point is restricted by aspects of the sculpt. NECA has gotten much better about adding articulation, but for I think they generally take a sculpt-first approach. There are a few relatively easy points to add, such as a swivel on the right forearm, that would make this figure even better. Hivey comes with two accessories: a removable shoulder cannon and his “battle staff.” On other Predator figures I’ve found the shoulder cannon clings loosely and tends to become dislodged when the head is moved, but on Hivey – or my Hivey, at least – it’s quite secure. The staff looks great and fits perfectly in both hands. I don’t have the other two Predators yet, so I’ll refrain from saying this is the best of the bunch (Nerditis reviewer Ridureyu, at least, thinks otherwise). But due to the color scheme and creative sculpting, I like this figure even more than my Jungle Predator – this is my favorite Predator figure yet. And the price point – $18 at many retailers – can’t be beat for a figure of this quality. 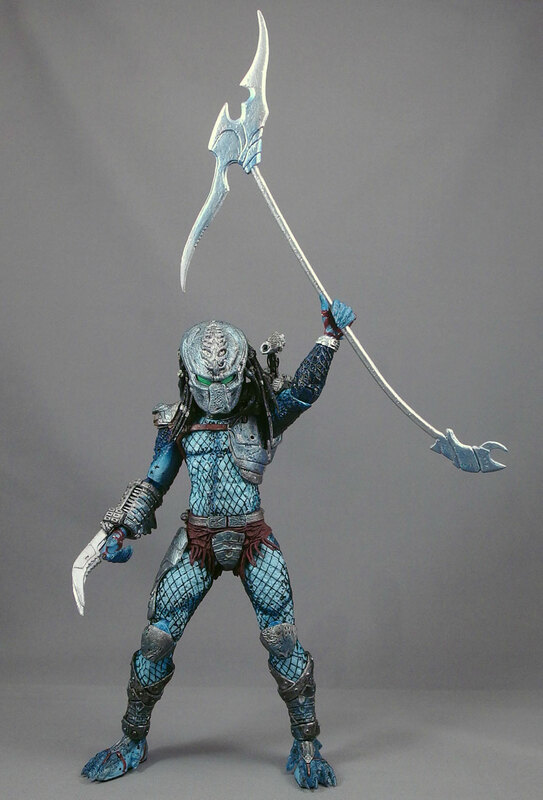 It remains to be seen if it will be topped by next month’s Battle Armor Lost Predator, which also looks fantastic. And the response to the Kenner wave has been strong and there are already more Kenner-inspired figures in the works (though whether they’ll be Predators or Aliens I’m not sure – but a NECA Gorilla Alien would be a sight to behold). He looks great! I may have to pick him up! I love how his weapon looks like it was salvaged. The little pits and sings on the texture really make it. These guys look amazing. If I run across them, I think I'll be powerless- I really want the lava planet Predator,though, as that guy is just crazy awesome. I loved the Kenner line, and these updates are fantastic. I think the Lava Planet may be my favorite, but I have not opened the other two yet. Keep'em coming, NECA! Got him Saturday–$16.99 at Toys R Us! I'm probably mis-remembering, but colorwise he reminds me of that arcade Aliens vs. Predator four-player beat 'em up game. Here's to hoping they make some Kenner-style Marines. They could start off by just repainting the helmeted version of Hicks, similar to the "video game" repaints of Jason, Freddy and Robocop.